The fossil skeleton of a small lemur like creature, nicknamed Ida, is being hailed as the missing link in human evolution. 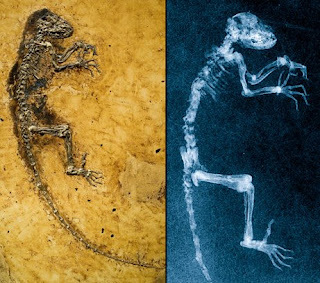 The almost complete fossil, estimated to be 47 million years old, was unearthed in 1983 in the Messel Pit near Darmstadt, Germany, but its significance is only now being revealed, after extensive study by a team of scientists in Oslo. Ida or Darwinius masillae bears a long tail but also has several human characteristics, including an opposable thumb, short arms and legs, and forward facing eyes. Her skeleton is so well preserved that you can see individual hairs, finger nails (which confirms she is a primate) and even the remains of her last meal. The scientific name honours Charles Darwin, as both the bicentenary of his birth and the 150th anniversary of the publication of On the Origin of Species fall this year. The second part is taken from the Latin for the Messel Pit. Sir Davis Attenborough has hailed Ida as extremely significant and said this "little creature is going to show us our connection with all the rest of the mammals". He presents a new documentary on Ida and her significance on Tuesday next, on BBC 1. Below is a short video where he explains her significance briefly.